Ortho Sport & Spine Physicians is Atlanta’s premier provider of minimally invasive spine procedures. Our practice features a team of double board certified Interventional Spine physicians who are highly trained and qualified to perform endoscopic spine surgery, also known as “band-aid back surgery”. Using advanced minimally invasive surgical techniques, we are able to achieve amazing results for our valued clients. Our physicians are committed to helping patients with chronic or acute spine, back and neck conditions and injuries achieve long-term pain relief and return to full function and an active, healthy lifestyle. A spine stabilization procedure provides an attractive alternative to traditional open spine fusion surgery. With spine stabilization, we can limit the amount of motion at the disc level while still allowing some flexibility. This can help to prevent additional problems from occurring in the future. Spine stabilization can be used to reduce or eliminate pain and improve function for patients with Spinal Stenosis, Spondylolisthesis and other chronic pain conditions affecting the spine. With endoscopic surgical stabilization surgery, there is minimally blood loss, a smaller incision and fewer chances of complications. In addition, patients recover quickly and are able to return to normal activities much faster when compared to open spine fusion surgery. 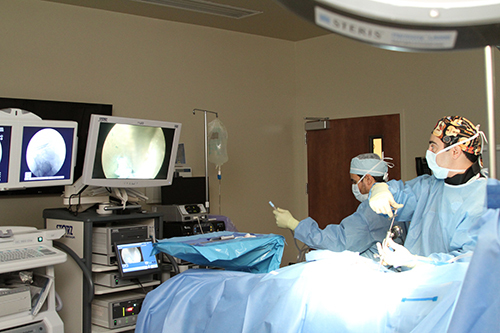 The Interventional Spine Physicians from Ortho Sport & Spine Physicians are experts when it comes to performing endoscopic surgical stabilization procedures. Using this advanced surgical technique, we have helped many patients get relief from their back and neck pain so they can once again participate in the activities that they enjoy. Now we would welcome the opportunity to help you regain your quality of life! What is Endoscopic Surgical Stabilization? What is endoscopic surgical stabilization? Endoscopic surgical stabilization is a surgical procedure than involves the use of a dynamic stabilization device to stabilize to limit movement at the disc level while still allowing some flexibility. At Ortho Sport & Spine Physicians, spine stabilization procedures are performed as outpatient surgeries in our outpatient surgery center. After the procedure, our patients return home with an incisions small enough to be covered by a small band-aid. If you would like to get more information or to find out if you are a candidate for this procedure, please contact our Atlanta Endoscopic Surgical Stabilization Specialists at Ortho Sport & Spine Physicians to schedule a consultation with one of our spine physicians. For your convenience, our office works with most insurance providers and we also accept several other forms of payment. We look forward to helping you stay active and live your best life!